A super villain named Megamind has grown up in the shadow of Metro Man, but after years and years of losses, Megamind finally defeats his nemesis. Once the glory of beating his longtime foe wears off however, Megamind finds himself questioning the point of being evil when their is no one else to stop him. 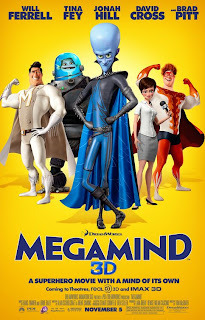 "Megamind" isn't as funny as it could be with great comedians like Will Ferrell, Tina Fey, David Cross and Jonah Hill but it is an amusing take on the superhero genre that is a blast for the whole family. Probably the best aspect to the 3D animated feature is the fact it changes gears from what most would expect from a superhero/super villain storyline. Instead of focusing on battles between two nemesis, the film takes a thoughtful look into what actually makes someone a villain. It even provided a few unexpected twists that ended up making the comedy all the more enjoyable. Dreamworks seems to be finally getting in the swing of things with their animated films. Previously, most of their toons just came across as cheap and cloaked in slapstick. While the studio has continued using comedians as the focal point of each of their animated features, they are finally starting to put heart and worthwhile character development into them. This isn't to say "Megamind" is a home run, because its not. It is definitely not my favorite Dreamworks film this year, but it is miles better than Monsters vs. Aliens, the Madagascar movies, Bee Movie, Flushed Away, Over the Hedge and the last two Shrek sequels. I have no problem with Dreamworks going after talent to voice their films, but they need to focus first and foremost on story and content versus just some big and funny names being animated into corny characters. As far as the animation, "Megamind"is highly refined. The look of the film continues Dreamworks usual animation style giving the characters somewhat awkward styling and features. The obvious one here is Megamind's big head, but the animators actually do a impressive job of making the character look as realistic as possible. I thought it might be hard to find realism in a blue alien character with a ginormous head, but again the animators do a remarkable job. The weird part about "Megamind" is all the human characters appearances seem more awkward than Megamind. Roxanne Ritchi (voiced by Tina Fey) is made to look adorable, yet her character doesn't look like any real human being I've ever seen. Same with Metro Man (Brad Pitt) and Tighten (Jonah Hill) who are given odd proportions. While the proportions are a bit off, the rest of the exteriors, sets and other objects are done very well. This isn't to say that I found the animation distracting, because I didn't, its just worth noting that Dreamworks has continued to use an edge to their animation that differentiates it from the other studios while still maintaining somewhat lifelike characters. I guess I should briefly touch on the voice cast. Generally I don't really like major comedians in animated comedies. I hate thinking a whole movie, oh that's Will Ferrell, Ben Stiller or Jack Black. It tends to take me out of the movie. Thankfully here, Ferrell does a different voice and while you can tell the entire 97 minutes its him, his voice-work doesn't come across as overbearing. Ferrell as expected, offers some great jokes throughout the film that remind us why he's so funny, but the movie never goes overboard with any of the voice cast. Tina Fey also does a solid job offering her typical snarky cynicism, but at the same time thats kind of the problem. The voice is totally Tina Fey. I don't want to watch "Megamind" but keep thinking I'm watching an episode of 30 Rock. I could almost make the same argument against Jonah Hill however (without giving away his character development), he changes it up as the film progresses. Lastly I'd like to talk about David Cross who was my favorite character in "Megamind." Cross's character Minion is cute, full of personality and a perfect compliment to Ferrell's Megamind. The two of them play off each other exceptionally adding a ton of likability to the quasi-evil villains. A year ago Dreamworks gave us Monsters vs. Aliens which was a epic fail in the 3D gimmick category. It seems with their last two efforts they have learned their lesson. "Megamind" doesn't waste time using sight gags in 3D, but instead uses the medium to create space. Their are a number of scenes throughout the city of Metro City all of which highlight the 3D technology very well. One perfect example is after Megamind defeats Metro Man and is invading the city with his brain bots. Perfect use of depth and scope. They also do a fairly impressive job with all of the flying, however the film fails in comparison to Dreamworks previous 2010 3D flying animated feature. In conclusion "Megamind" is not going to win any awards for breaking the mold or for innovation, but it is definitely a worthwhile family film. Our entire family enjoyed it and it surpassed my somewhat low expectations with enjoyable character development, hysterical dialogue delivered by all parties and a few twists that left me walking out content.